From today’s vantage point, we can identify two critical drivers of change shaping the future of readiness for further learning, work and life: the rise of smart machines and the decline of full-time employment. But we cannot yet know what extent of technological unemployment we will face or how much support individuals will have in navigating the changing employment landscape. In face of such uncertainties, stakeholders need to help people develop our uniquely human attributes along with developing flexible skills that we can apply across settings. Putting social-emotional skill development at the center of learning promises to help individuals develop the foundation necessary to navigate uncertainty throughout their lives. 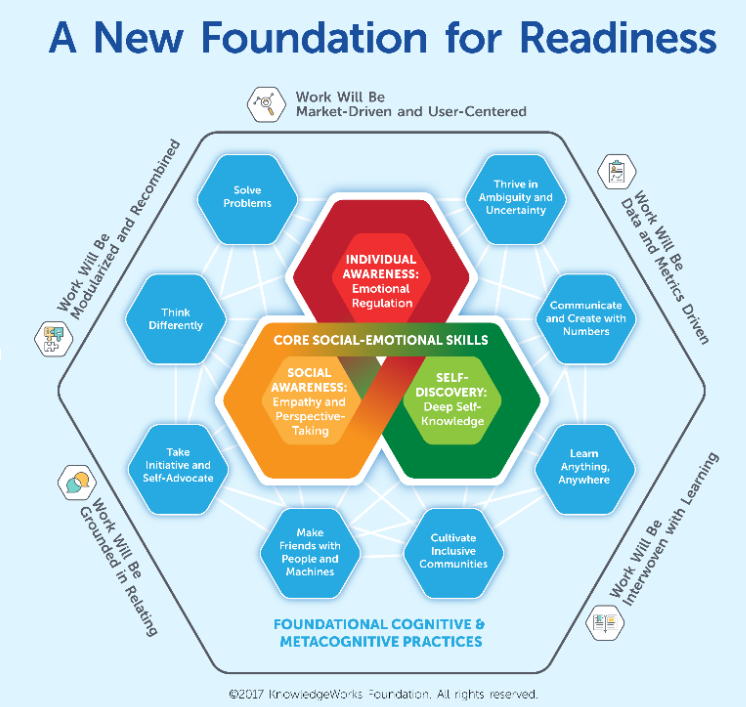 The new foundation for readiness illustrates how redefining readiness from the inside out – focusing on human development rather than attempting to prepare learners for any particular future of work – can provide a platform for future success. This new foundation for readiness is grounded in the human qualities that are most central to our relationships with one another and which are most difficult to code. Social-emotional skill development will need to be supported in integrated ways alongside the mastery of content and the application of skills and knowledge to specific contexts. Education institutions will need to balance supporting learners in preparing for their first-careers while also helping them develop the adaptability and resilience needed to navigate the changing economy and the ways of thinking necessary to address complex problems. This entry was posted in School Reform & Leadership, Teacher Preparation and tagged 21st century learning, deeper learning, learning community, personalized learning, social emotional learning. Bookmark the permalink.